I grew up eating Mexican food and pizza. I did not grow up eating curry! In fact, before making this recipe I’d only had curry maybe once in my adult life. Over the last several months I’ve made this recipe many times, and Tommy and I just can’t get enough. The flavors are just on a whole new level for us. The spices excite the palette of this Latina, because they are not the usual for me. It is totally different than anything else I cook. The sauce is thick and creamy, and the potatoes just soak it up. Hands down, the potatoes are my favorite part of the dish. Most of the time I make this dish vegetarian style. Like a lot of you know, I eat a mostly vegetarian/ pescatarian diet. I leave out the chicken and throw in extra potatoes. 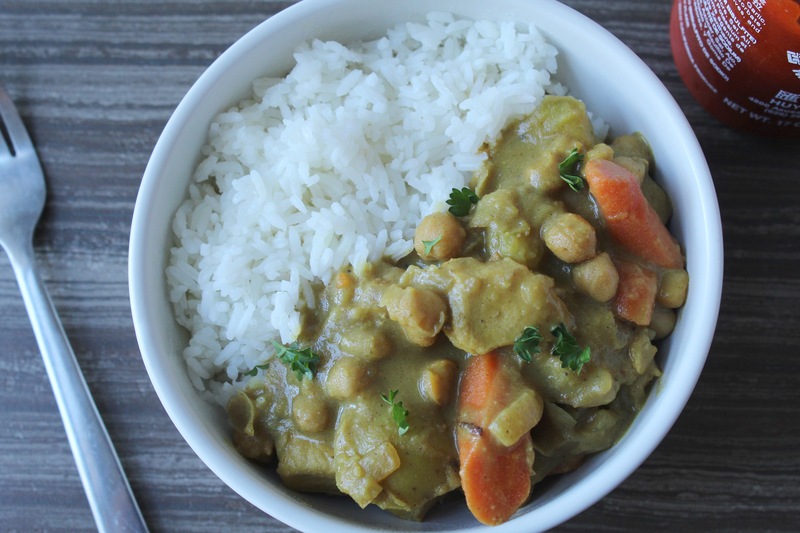 Watching vegan health and cooking videos is something I enjoy doing, and one day I saw a recipe for coconut curry chickpeas by Mary’s Test Kitchen. I really wanted to try it, so I got brave and tried something new. I am so glad I did. I made some changes, and made the recipe more to our taste. 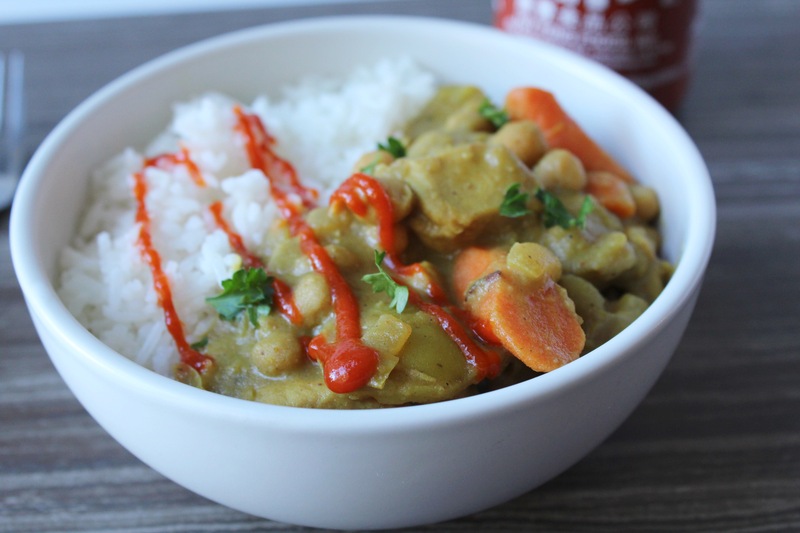 If you already love curry or if you’ve never had it, my hope is that you try this recipe. Let me tell you, I am never going back to my non-curry eating ways! 1. Make sure all vegetables are cut and ready to use in the recipe. Add oil to a large soup pot and heat over medium heat. Lightly season chicken with salt and pepper to taste and add to the pot. Sauté chicken until it is cooked through, stirring occasionally. Remove chicken from pot and set aside. In the same pot add onion and cook for 2-3 minutes adding a little more oil if needed. Add garlic and cook another 1-2 minutes. 2. Next, add the curry powder directly to the pot with the onion and garlic. Cook for less than a minute stirring frequently. You just want to heat the powder to release all the flavor and aroma. Quickly add in chicken broth, and stir the bottom of the pot to scrape off any veggies and curry powder stuck to the bottom. Add in the potatoes, carrots, chickpeas, the piece of ginger, the cooked chicken and stir. Add a little more salt and pepper to taste if desired. Bring to a boil then reduce to medium low heat and cover the pot. Let cook for 15 minutes or until carrots and potatoes are tender. Remove the piece of ginger and discard. 3. Lastly, reduce heat to low and stir in the coconut cream, sugar, and soy sauce. Let it simmer on low heat for 2-3 minutes then check for seasoning. Add extra salt or soy sauce if desired. 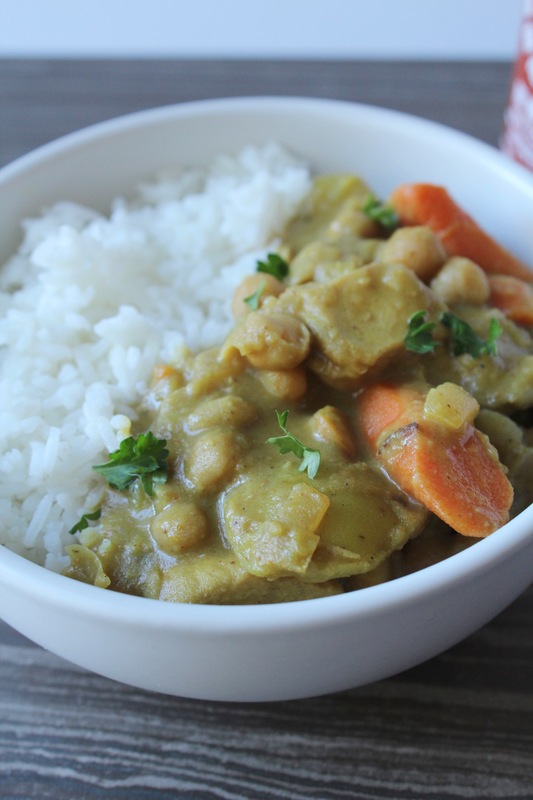 • I cook this curry in my large, heavy dutch oven. Any large soup pot will work. • We love this even more reheated the next day. It gets extra thick when it is refrigerated overnight. 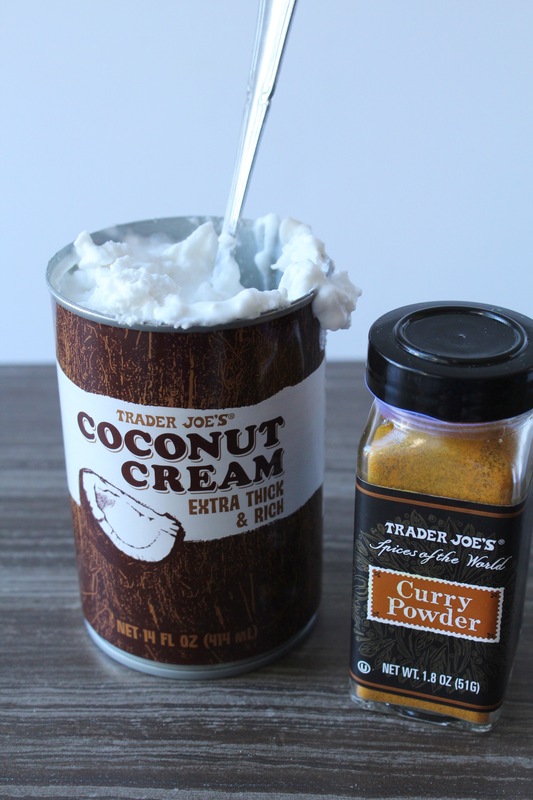 • Like a lot of my recipes, I purchased the majority of my ingredients at Trader Joe’s. • You can freeze the left over coconut cream and ginger for future recipes. Yay! That’s great… I hope you enjoy it! What’s your favorite type of curry? My favorite is yellow Thai curry. Yum delicious! I love curries especially the Indian curries with a little kick. I mix my own spices but buy graham masala. I too make a lot of vegan dishes for myself 🙂 and curry is always the top of my list. Thanks for sharing. Wow! that looks delicious! I am going to try this! Thanks for sharing! Thank you so much! Its one of our household favorites!